Be the first to share your favorite memory, photo or story of Lodema "Nickie". This memorial page is dedicated for family, friends and future generations to celebrate the life of their loved one. 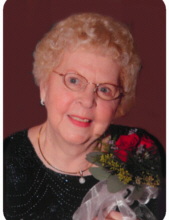 Lodema M. “Nickie” Kurtz, 94, of Middletown, died Saturday, November 10, 2018, at Otterbein - Middletown. She was born in Middletown on October 7, 1924 to parents George M. and Della M. (Lovelace) Parks. Nickie had worked as a purchasing clerk for Armco Steel Corp.
Mrs. Kurtz is survived by her daughters, Charlene G. Kurtz, Cheryl K. (Richard) Pratt; stepdaughter, Karen G. Florea; brother, Harold Parks; and numerous grandchildren, great grandchildren and other loving family & friends. She was preceded in death by her loving husband of 39 years, Charles P. Kurtz; son, Arthur A. McQuinn II; stepson, Charles "Randy" Kurtz; father, mother & stepfather, Joseph Renfro; and sister, Lorraine Wheeler. Nickie & Charlene would like to thank all of the staff at Ohio’s Hospice of Butler & Warren Counties for their care. Thanks to the staff of Otterbein Senior Lifestyles for the love and outstanding care they provided every day. Special thanks to Jean Anderson, who made Nickie’s last wishes and travel dreams a reality; thanks for providing loving care every step of the journey. Funeral Service will be held Friday, November 16, 2018 at 2:00 pm at WILSON-SCHRAMM-SPAULDING FUNERAL HOME, 3805 Roosevelt Blvd., Middletown with Reverend Randall Wheeler officiating. Visitation will be prior to the service from 1:00 - 2:00 pm. Interment will be at Woodside Cemetery. Memorial donations may be made to Ohio's Hospice of Butler & Warren Counties, 5940 Long Meadow Dr., Franklin, Ohio 45005. To send flowers or a remembrance gift to the family of Lodema "Nickie" Kurtz, please visit our Tribute Store. "Email Address" would like to share the life celebration of Lodema "Nickie" Kurtz. Click on the "link" to go to share a favorite memory or leave a condolence message for the family.